All refunds for cancellations are in the form of a credit voucher for a future stay at our property. If the cancellation is 30 days prior to your arrival date, there is no cancellation fee. For cancellations more than 14 days prior to your reservation, there is a $69 cancellation fee. For cancellations more than 7 days prior to arrival, there will a 50% cancellation fee. Cancellations closer than 7 days prior to arrival are non-refundable. 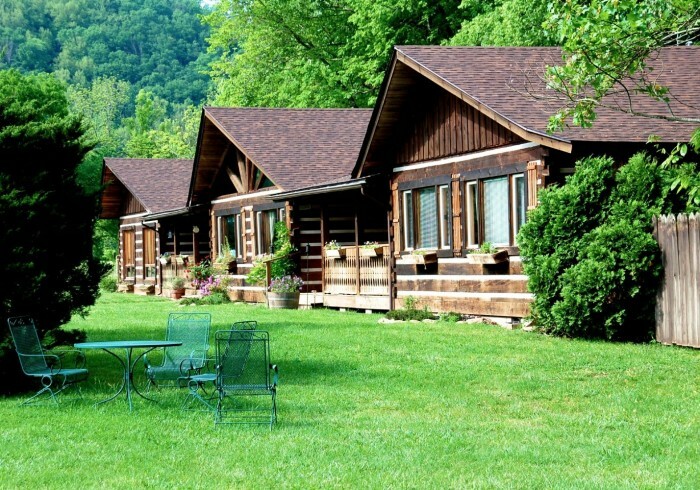 Bed and breakfast with a casual, romantic, rustic, retreat into nature style log home along the creek/forest boundary. Queen and king rooms available, two with a private hot tub. Dinner by reservation (at least 48 hours please!) Plenty of nature books and maps for our naturalist guests who want to explore the Great Smoky Mountains National Park and the over 700 miles of trails. Each room has cathedral ceilings. Large living and dining room, library, and front and rear porches. Creekside rooms have a narrow shared balcony right over the creek. Geothermal heat pump for heating/cooling. Oak floors throughout, many interior log walls as well as the exterior. This is an architectural treasure that has been featured in Log Home Guide magazine. Great for celebrations, anniversaries, fun getaways. Campfire area available for evening star-gazing. Address 1: 166 Middle Creek Rd.